The association has its residence in Berlin. The organisation fulfils its goals and objectives politically neutral and independent from governments and worldviews based on free and democratic principles. All documents created by or sent to the European Youth Press should be eligible to be read by members of European Youth Press on request. The association pursues exclusively and directly non-profit purposes in the sense of the section tax-privileged purposes of the tax code. The association is working for the public good and does not pursue primarily self-economical purposes. Materials of the association may only be used for statutory purposes. The members do not receive allowances from the association in their characteristic as a member. They have no entitlements towards the organisation if they cease to be members of the organisation. No person may profit from the association in ways, which are not in line with the aims and objectives of the association, or by disproportionately high remunerations. 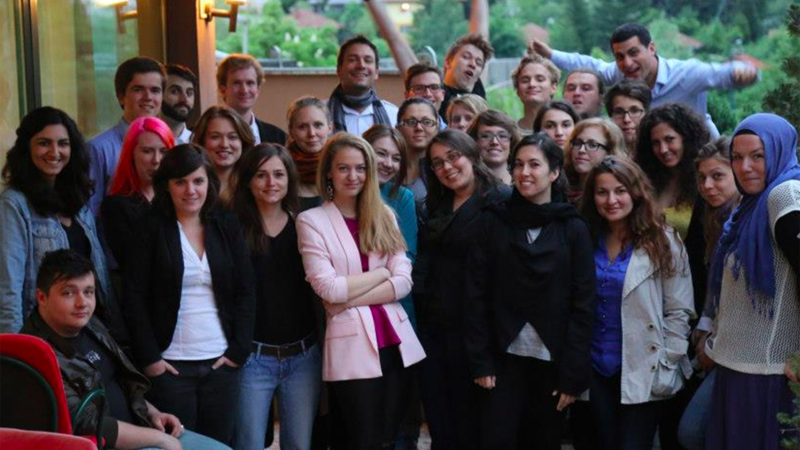 European Youth Press has two kinds of memberships: full member and observer member ship. Membership can be applied for in written form with the board. National organisations of young media makers in Europe, whose aims and objectives correspond with the ones written in §2 (1). In addition, they must be legally established since at least one year and must be politically independent. Transnational or European media organisations, whose aims and objectives correspond with the ones written in §2 (1). In addition, they must be legally established since at least one year and must be politically independent. They also need to have more than 50 individual members and work in more than five European countries. The admission of full members is decided by the General Assembly following standard criteria after an organisation had an observer status for one year. The admission of a full member requires the votes of 2/3 of all full members. Any youth media organisation that is legally established, if it potentially meets the criteria of full membership one year after its application. After one year observer status the General Assembly may decide based on standard criteria to give full membership to the observer, to prolong its observer status, or to refuse its application. Youth media organisations that do not fulfil the criteria for full membership may also apply for observer status and remain observers in the organisation for an undetermined period of time. To end its membership, the member makes a written declaration to the executive board, respecting a period of three months before the conclusion of the financial year. Member can be excluded by resolution of the General Assembly, if it acts against the aims and objectives of the association or does not follow its membership obligations. The member is to be invited to the General Assembly and to be heard. The member can be excluded with a 2/3 majority of votes of all members. At ordinary General Assembly is to be invited by the board if necessary, but at least once per year. The invitation is to be sent by the board one month in advance via Email, including the draft agenda, the last known member email address. Members who do not have an email address are invited by letter. The meeting of the members is quorate only if the invitation is valid and two thirds of the full members are present. Member organisations should delegate representatives to the General Assembly being major of age, but being younger than 30 years. An extraordinary General Assembly takes place if the Executive Board, the Advisory Board or the Internal Auditors or at least 40% of the members apply for one in a written form and with their reasons. This General Assembly must then take place in the next two months after the request. The regulations for invitation from § 7, 2 are still valid. Decisions are taken, if the statutes say nothing else, with simple majority of the delivered votes. Each member has one vote. Cumulative voting is inadmissible. The General Assembly has to vote on the financial report and the activity report of the previous year and the budget plan and the working plan for the following year. It elects two internal auditors for the duration of two years. After the financial closing of a year, they make an internal audit. About the decisions and about the substantial process of negotiation, minutes are to be taken. They are to be signed by the chairman of the General Assembly and the minute-maker. Minutes are to be made accessible for the members within four weeks. The communication language in the General Assembly is English. Between two General Assemblies, the member organisations represent themselves towards the European Youth Press by their authorised contact person. This contact persons is responsible for the communication between their organisation and the European Youth Press in order to provide mutual feedback towards each other about current issues. The contact person has to be informed about current activities, financial issues and structural changes of the European Youth Press. This contact person is responsible for the communication between their organisation and the European Youth Press in order to provide mutual feedback towards each other about current issues. The contact person has to be informed about current activities, financial issues and structural changes of the European Youth Press. The General Assembly can establish Working Committees for the accomplishment and continuous running of certain projects. Guests can participate in the General Assembly according to approval of the General Assembly. Guests have no right to vote but have to be listened to. four, maximum nine persons and the Treasurer. The members of the Executive Board must be under the age of 30 years; they can be but are not necessarily members of the member organisations. The adhesion of the Executive Board is limited to the property of the Association. The activity in the Executive Board is honorary. The members of the Executive Board are elected by the General Assembly. The term of the members of the Executive Board is two years. They remain in office until the installation of the new Executive Board. The term of office ends within six months after the completion of the 30th living year of the individual member. When a member of the Executive Board resigns, a by-election can take place at the next General Assembly. The association is legally represented by two members of the Executive Board. The Executive Board selects out of its circle two Executive Board speakers and if necessary resort leaders. The Executive Board acts to the duties and responsibilities stated in the rules of procedure. The decisions of the Board Meetings are to be logged in written form and to be signed by the writer of the minutes and one further member of the Executive Board. All minutes of the Board Meetings are to be sent to all the member organisations within four weeks. The Executive Board can create an administrative office with a Secretary General, who can legally act and represent the organisation. The regulations of the administrative office are defined and described in the Rules of Procedure as well as details regarding office employees’ entering and quitting positions. The Executive Board can establish Working Committees for the accomplishment and continuous running of certain projects. The internal auditors consist of two people elected by the GA for two years. They critically check the finances and the entire organisation. After the closing of the financial year, they make an internal audit report. The Advisory Board consists of at least three, maximum 7 persons. On request, it gets insight and provides advice for the Executive Board on the whole organisation, especially finances. The Advisory Board should report about its activities on every General Assembly. The Advisory Board can call for an extraordinary General Assembly, if severe irregularities within the work of the Executive Board are found. The General Assembly decides on changes of the statutes the changes of the aims and tasks of the association and the dissolution. Proposals to changes of the statutes, the changes of the aims and tasks of the association have to be provided to the members at least three weeks in advance before the next General Assembly. For adoption of decisions on these, a majority of 2/3 of the voters present at the beginning of the meeting is necessary. Changes or additions to the statutes, which are prescribed by the responsible register office or by the tax office, are made by the executive committee and require no adoption of resolution by the General Assembly. They are to be communicated to the members at the latest with the next invitation for meeting of the members. In the case of dissolution, with extraction of the legal capacity of the association or with omission of the tax-privileged purposes the entire fortune falls to the “reporters without borders” with the obligation to us it for non-profit purposes in the sense of the tax code excluding and in accordance with § 2 of this statute to use directly. The statute enters into force when it is agreed upon by vote. The legally binding version of the Statutes is its German translation. The present Statutes, the elected representatives (i.e. members of the Executive Board, members of the advisory board) and the various member organisations of the Association are to be presented at the official website of the association (www.youthpress.org) together with contact information. Supplemental documents form an integral part of the Statutes, but they can be adapted to the needs of the organisation at every General Assembly without implying the need for an official statute change.